How well you get along with your coworkers can have a huge impact on how effective an engineer you can be. I’m not just talking about meetings, but how well you can collaborate on projects. People generally know you don’t pass off shoddy work or incomplete projects to the next person who has to work on it for you. But sometimes I’ve seen exactly that in the design world. Even though most CAD programs track everyone who touched that part or drawing, people seem to think they can get away with things they generally wouldn’t try in a report or presentation. Don’t suppress elements. This is the lazy person’s solution to dealing with conflicts, and critical details can go missing. If your assembly is ginormous, make a simplified rep. You’re probably using a specialized rep for the drawing anyways, so make a cleaned up version somebody can pull up without having to go home waiting for it to render. Model your parts like you’d manufacture a part. Somebody is going to use this eventually to make a part. Even if they just go off the drawing, the best drawings start from models that are made well and modelled in a way that’s intuitive to the person who’s going to make it. Think like a machinist. You can’t design in a vacuum. Don’t be afraid to ask for help. We all did at some point. Whether there’s a trusted expert at your work or just someone who knows a little more than you. Don’t be afraid to check out the PTC community, forums and user groups online as well. I whole-heartily agree with the “think like a machinist” statement. I’ve seen so many parts that look absolutely gorgeous until someone asks “how are they going to make that?”. That’s many’a’design killer. With that being said, I still have my love-hate relationship with Pro/E. Sadly, SnowU uses it for their UG program so I’ll have to suffer through it some more. Personally, I’m a SolidWorks user. 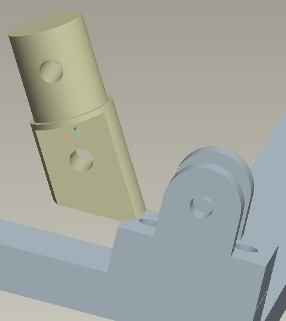 I’m not sure how ProE works, but SolidWorks makes it very easy to implement that idea of “think like a machinist.” If you only use extrude and cut it’s very hard to design something that can’t actually be machined. Exploding assemblies is also a great way to visualize the assembly process… I’ve seen many designs that required tightening bolts where the nut isn’t accessible. Unfortunately, it’s a sad statement that many engineers/designers don’t know to design something from the point of manufacturability. They design it to work within the limitations of the CAD software. It would benefit everyone if they had to fabricate and/or assemble something that they’ve designed. Once, I critquited someone else’s structrual design of a large steel weldment. The CAD drawings were acceptable, but the engineer had not considered the residual stresses from the amounts of welding that he wanted to give the part rigidity. I knew that once the part went into the machine shop for finish machining, the part would change shape from the released residual stresses each time a different surface was machined. You need to understand the manufacturing process. Not everyone has access to the latest and greatest fabrication equipment. Low quantity production is much different from high volume. Making one of something is much different that making 10,000 of them. Any CAD system is just a tool. Yes, you need to understand how to use that tool. Every engineer still needs to use some common sense when he/she designs something. Talk to your skilled machinists, welders, and technicians within your organization and get their input on the design. Otherwise, it may end up being garbage in, garbage out.